Hey friends! I’m so excited to (finally!) 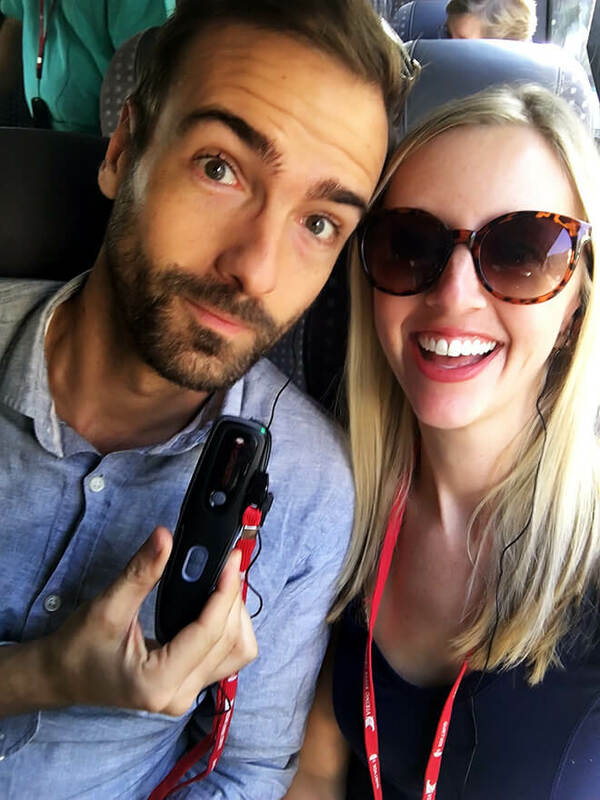 be sharing with you all today about my trip to France last month, where a little traveling dream of mine came true — Barclay and I got to sail together on a Viking River Cruise!! 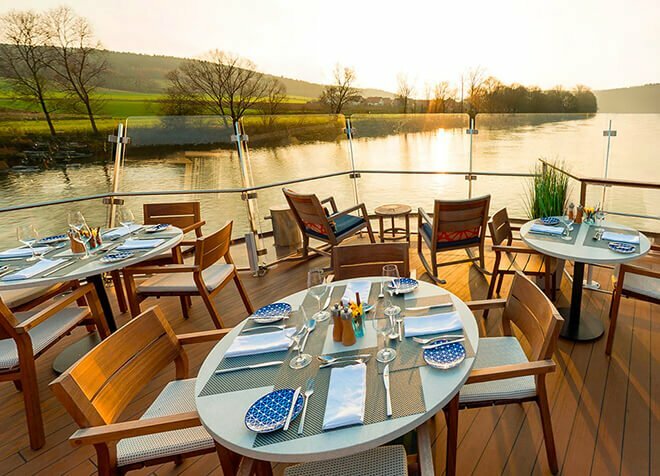 Like probably many of you, I was first introduced to Viking River Cruises thanks to those stunnnnning commercials that used to come on during Downton Abbey. I was already somewhat familiar with cruising, having sailed on a handful of huge ocean cruise ships in the Caribbean. But these river cruises caught my attention because they seemed like a totally different experience. 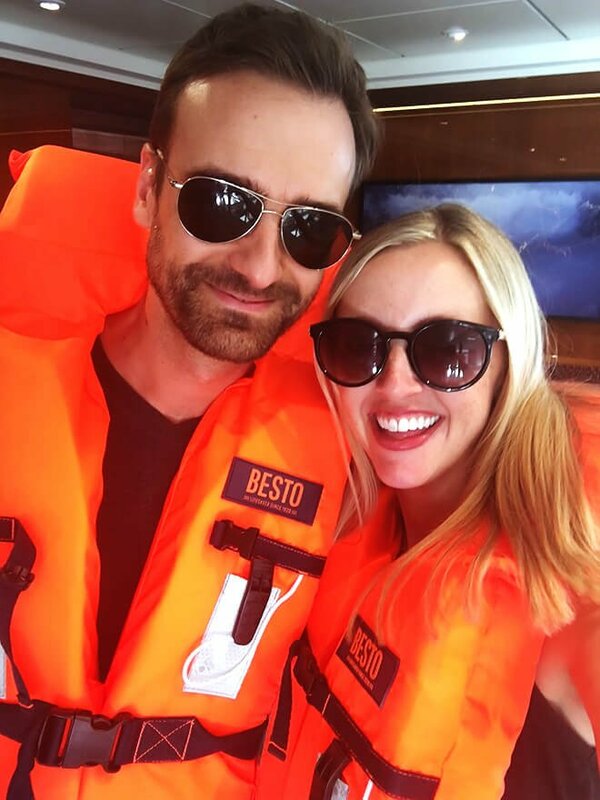 From the design of the ships themselves, to the vibe of the passengers, to the breathtaking places they travel, even to the meals and events on board, they just looked so relaxing and downright dreamy. And, as someone who absolutely adores Europe, yet (weird story) literally hurt my back so badly while hauling a suitcase across Ireland that I had to have back surgery a decade ago, I’ve gotta be honest and say that the idea of traveling from place to place in Europe via ship, without having to haul luggage down cobblestone streets and up flights of 300-year-old tiny staircases, sounded freaking brilliant. So needless to say, when Viking reached out last winter and asked if I would be interested in coming to sail with them in Europe, I literally jumped up and down and couldn’t say yes fast enough. And then, even better, I found out that Barclay was invited to come with me (double yay)! Couldn’t have been happier. 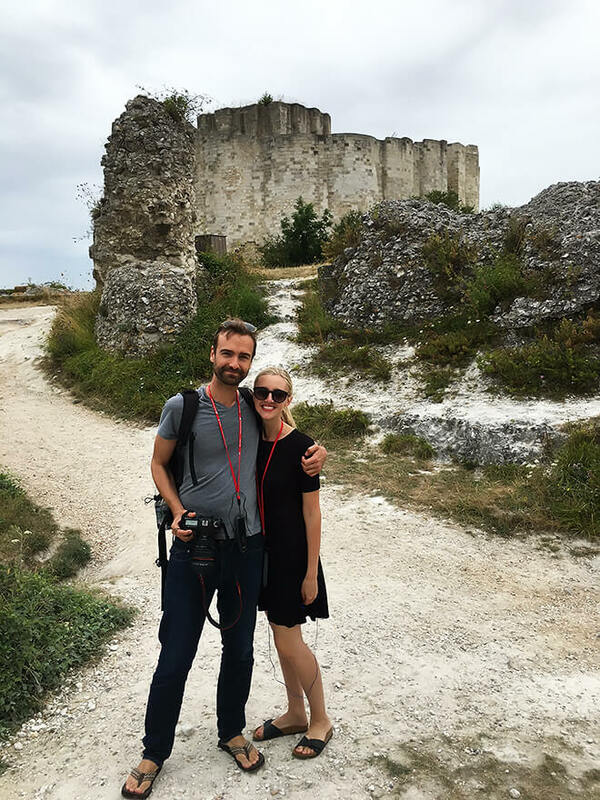 So he and I immediately started reading about the 24 different cruises that Viking offers in Europe (not to mention their amazing destinations in Asia, Russia and Egypt, which have also now been added to my traveling bucket list). We pretty quickly narrowed things down to France, which was a place we had both been wanting to return to, but we had a hard time choosing between the various options there. Ultimately, our hearts kept tugging us back to Paris. So we signed up for this cruise, which starts and ends in the City Of Light. And we couldn’t have been happier that we did. I mean, of course, we figured that would be the case and had high expectations going into it. ;) But we also had all sorts of questions about what river cruise life would actually be like. Would we be the youngest ones on the boat? Would the (included) daily tours be our style, or would we want to go exploring on our own? Would the rooms feel tiny and squished? Would we feel seasick with the motion of the boat? Would the whole experience seem worth the cost? And — let’s get to the important stuff here — would the food be amazing??? I’ve done my best to try and remember all of the important facts. So get ready, this post is a long one!! But please, if you have any other questions, don’t hesitate to ask below and I’ll holla back with anything I know. Deal? Deal. So actually, before we get to all of the details about sailing on the actual cruise itself, let’s talk for a minute about all of the preparations that took place before the cruise even began. First, you’ll be invited to register for My Viking Journey, a personalized website where you can can reserve your daily shore excursions (most of which are included, although you can pay for extra excursions), read all about what to expect on the cruise, ask questions, print travel documents and learn about optional upgrades such as air services, travel protection and extension packages. Seriously, their site is incredibly helpful, and Barc and I spent a really fun afternoon navigating all around it — a month or so we before we left — to choose our daily excursions for our cruise. 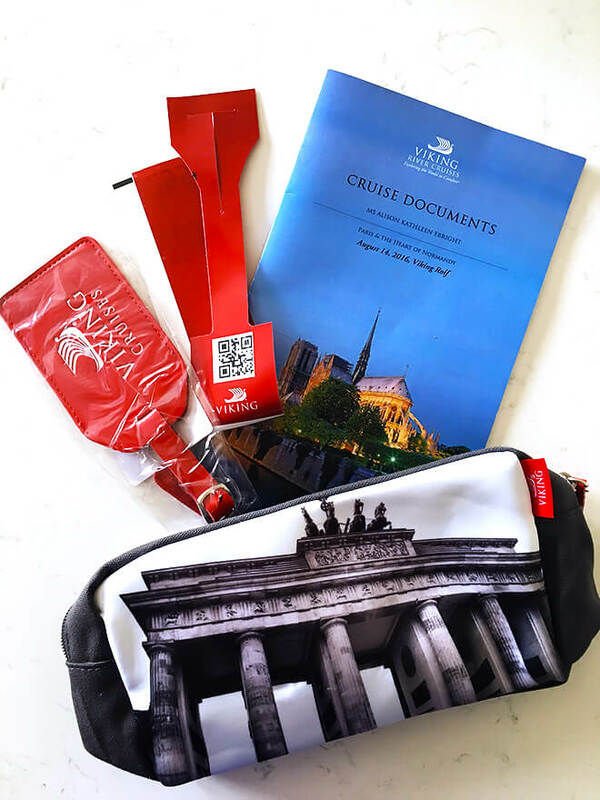 Next, you’ll have an awesome mail day, when a personalized little travel booklet (with all of your specific flight info, travel directions, packing instructions, and shore excursions are listed in detail), luggage tags, and a cute little travel pouch will arrive on your doorstep. Then if you have any other questions before your trip, you can either email or call Viking and they’ll help you out. Like, right away. For example, I randomly decided to try calling them to ask a question on the Sunday afternoon when Barc and I were planning our excursions, and a friendly representative answered my call and my question within basically a minute. They definitely have awesome customer service 7 days a week (! ), so don’t hesitate to make the most of it. Finally, once you fly into your destination country, I’m happy to say that Viking will also arrange your transportation from the airport to the ship, if you’d like. Barclay and I decided to fly in a day early to get some extra time in Paris, so we didn’t end up using this service on the way to our cruise. But we did take them up on the offer to drive us to the train station at the end of the cruise — at the crack of dawn, no less — for which we were soooooo appreciative. Guests are responsible for that cost, but it was so much easier than trying to book a cab or find our way to the closest train station ourselves at 6:30am! The personalized welcome packet that we each received in the mail. Alright alright, let’s get to the fun part — our ship! Actually, our longship, to be precise. Our home sweet home for 8 days on the cruise was the Viking Longship Rolf. The moment we stepped on board, I could tell that this was going to be a completely different experience than I’d had before with enormous ocean liner cruise ships. First of all, the Viking River Cruise longships are wonderfully small. I think ours only had about 95 staterooms, which meant there were less than 200 passengers on board. 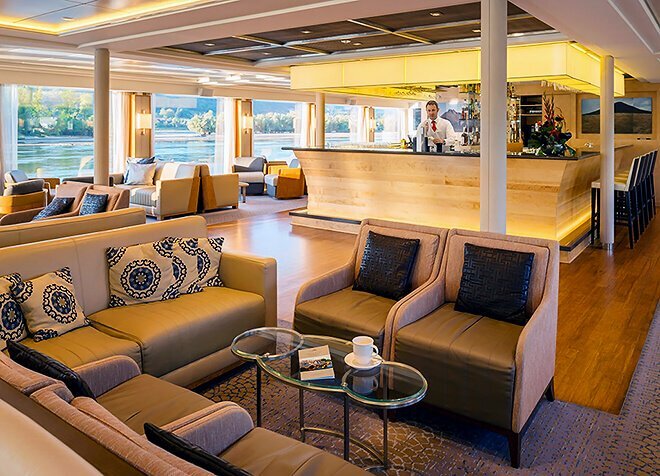 Then in addition to the staterooms, there was a large dining room, a large lounge (with a bar), a reception area, a cute little library and internet area, a sunroom dining area with a connected outdoor eating space, a deck on the top level, and that was it. While it was small, the entire ship seemed wonderfully spacious. Barc and I loved that every room on the ship had floor-to-ceiling windows, so it all felt really light and open and airy. That also meant that there literally wasn’t a single room on board with a bad view. I also really appreciated the simple Scandinavian decor that made everything feel extra clean and beautiful — not at all the gold-plated “Vegas”-y style of some of the ocean cruises I’ve been on. Also, the entire boat was surprisingly and blissfully quiet, which definitely made everything feel even more relaxing and peaceful. I think a huge part of that was simply having so many respectful guests on board. But I think the design of the ship definitely contributed to that vibe as well. It just felt so restful. We looked forward to returning to the ship for this very reason (well, and many others) every single day. The Aquavit Terrace: This is the official name for the sunroom/terrace I mentioned above. It’s the “casual” dining area on the ship, where daily breakfast and lunch buffets are served, as well as all sorts of snack buffets in between. (Trust me, you will not go hungry on these cruises. There is always amazing food available, especially on this terrace!) This was our favorite place to eat because it was a literal floor-to-ceiling sunroom (including sky lights! ), so it was the perfect way to soak up some sunshine and gorgeous views, especially if was a little chilly outside. That said, there’s also a door there to a little deck outside with more dining tables. So if the weather’s nice, it’s another great place to enjoy a meal or glass of wine. The Lounge: This room is about the same size as the dining room, and is full of all sorts of comfy seating areas where you can kick back and relax. It’s also the room where the various daily presentations and dance parties took place. And it’s home to the ship’s amazing bar, which was well-stocked and staffed by an awesome bartender. Alright, that’s a quick tour of the ship! 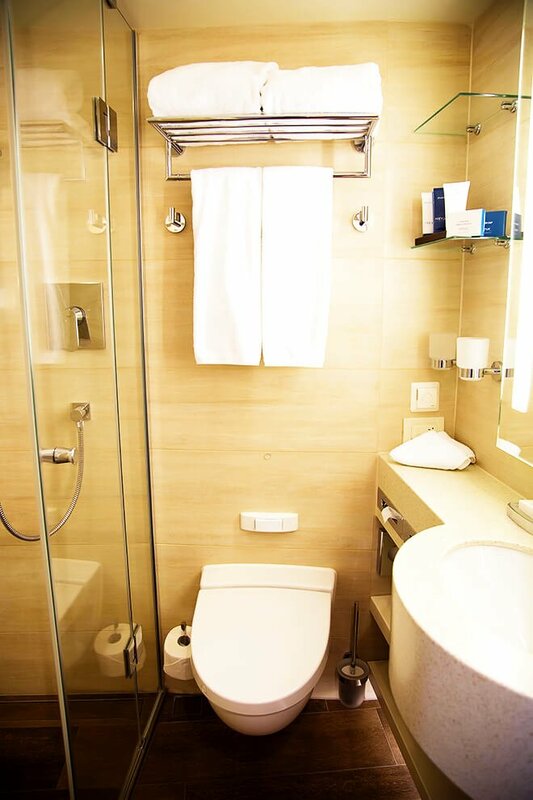 Now let’s move onto the topic that everyone asked about — the staterooms. The lounge and bar area, where happy hours and various events were held. The Aquavit Terrace deck outside. The main deck, and all of those glorious lounge chairs. Again, my only experience with cruising before was on large ocean liners, which always had tiny little staterooms where there was barely room to walk, and maybe a small window if you paid extra. 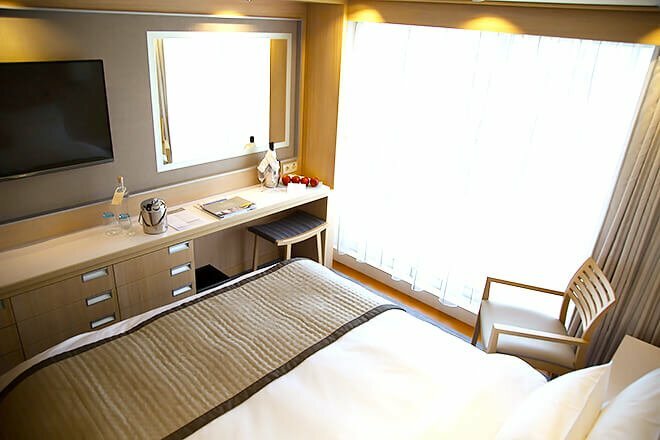 So needless to say, I was pleasantly surprised when I walked into my spacious, beautiful, sun-lit Viking stateroom with floor-to-ceiling windows. It couldn’t have been more different! And the best part…our room had a balcony. Oh my goodness, I think this sweet little balcony (complete with two chairs and a table) was my favorite part of the room, and quite possibly my favorite spot on the whole ship. Barclay and I spent as much time out there as possible, especially when the ship was sailing, and it was absolutely beautiful at all hours of the day. If you can fit it into your budget, I highly, highly recommend selecting a room with a balcony. So worth it. The other thing I loved about this room was that it — similar the rest of the ship — was incredibly quiet and peaceful. The walls were thick enough that we didn’t hear any noise from next door, or above or below. I mean, not that most of our guests were probably the party-all-night crowd anyway. ;) But still, worth noting. Definitely. And not at all. Granted, I’ve been on ocean cruises that hit rough waters at times, and I still didn’t really get seasick then. So, take my opinion with a grain of salt. But we literally could not even feel the boat rocking at all on our river cruise. In fact, whenever we knew that we were about to set sail, we had to look out the window to see if the boat was even moving. It was incredibly smooth. Also, sailing was incredibly fun. During our 8-day cruise, there were only a few times that we were simultaneously on the water and awake, which kind of surprised me. (I guess I hadn’t looked at the itinerary closely, but assume there would be more time on the water.) But those stretches — two in the mornings when we sailed until noon, and a few in the evenings when we sailed through the night — were some of Barclay’s and my favorite moments of the entire cruise. We loved everything about moving on the water!! We spent most of our cruising hours out on our little balcony, with espresso and pan au chocolat in the mornings, and wine and chocolate in the evenings, and absolutely loved watching the adorable French countryside pass by. Doing a quick safety training at the beginning of the cruise. What do you think — is orange our color? Night lights on the Seine. So where did we cruise to??? 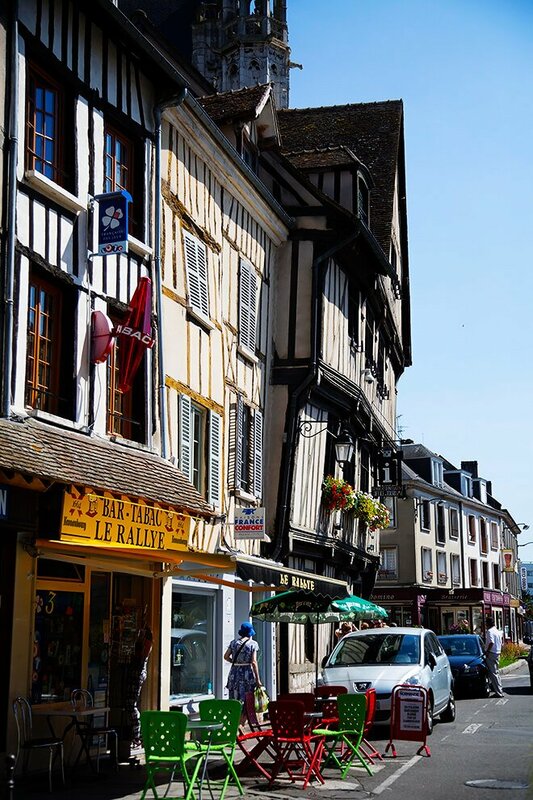 Barclay and I went back and forth for awhile when trying to choose which France itinerary. 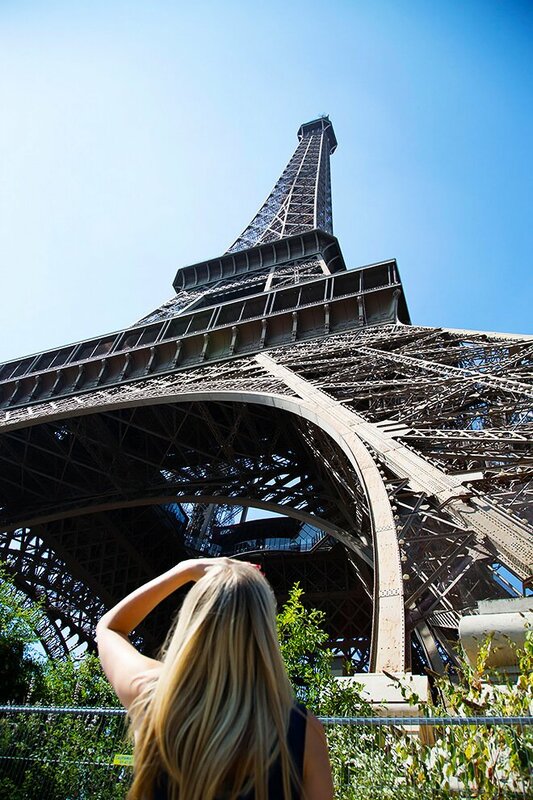 They actually have seven different French cruises to choose from — one from Paris to Prague, one from Paris to Zurich, two from Paris to Avignon, one from Avignon to Lyon, one from Bordeaux to Bordeaux, and one from Paris to Paris. We ended up going with the last one because, admittedly, we both simply love Paris and wanted as much time there as possible. (It’s one of Barclay’s favorite cities, and I hadn’t been there since college.) And we were so glad that we did. We genuinely loved the mix of experiences on our cruise. We got to spend plenty of quality time in Paris, taking a walking tour through some of the classics (Notre Dame, The Eiffel Tower, Champs-Elysees), driving by a few others (The Louvre, Arc de Triomphe, Palais Garnier, St. Germain des Pres, Luxembourg Gardens, Musee d’Orsay, Place de la Concorde, and the Grand Palais), spending a fun afternoon and evening on our own in Montmartre, and — of course — stopping by all sorts of local patisseries and boutiques and brasseries on our own along the way. 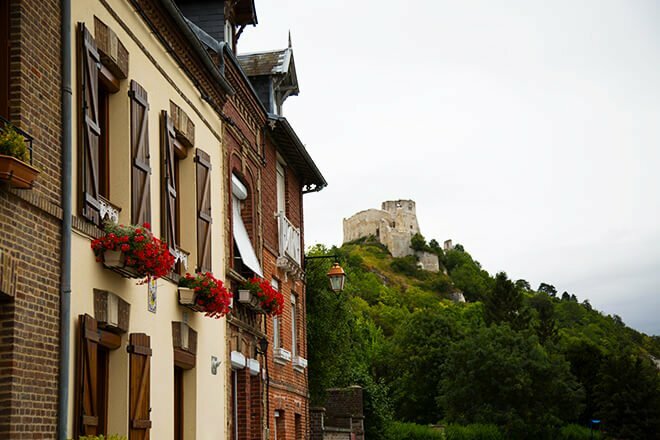 We also got to spend some time exploring some smaller towns, like Giverny (where we toured Monet’s home and gardens) and Vernon (where we went on a charming walking tour), and Rouen (home of Joan of Arc’s last stand, and an amazing cathedral light show), and Les Andelys (where we climbed up the ruin of Chateaux Gaillard). Without a doubt, though, one of our most memorable parts of the trip was our day spent in Normandy. I don’t think that either of us were prepared for how powerful and moving the day would be. But it is certainly one I will never forget. We had about two dozen American and Canadian veterans with us on the ship who were there for the tour that day, many of whom we had become friends with during the cruise. And getting to walk alongside them — visiting the museum that chronicled the history of D-Day, standing on the beaches where the troops came ashore, laying flowers that they gave us on graves of some of the 9400 service men and women buried in the cemetery there, and then standing together in silence listening to taps ring out during a brief memorial service we were invited to attend — was a deeply profound and humbling experience. It made us so aware, once again, that the freedom we get to experience every day came at such great cost. And it made us so thankful for the incredible sacrifices that so many have made. It also made us want to come home and read up more on that time in history, and see what lessons we both can learn from some of these incredible men and women who came before us. The leaning houses of Vernon. One of the zillion charming blocks we found walking around Rouen. 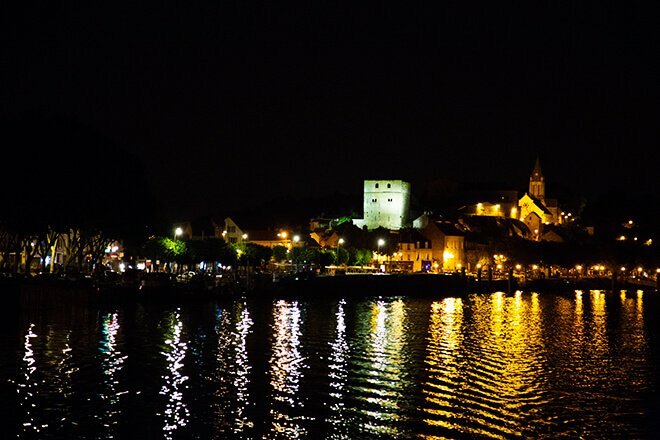 So, one of the BIG perks of traveling with Viking River Cruises is that daily tours — or what they call “shore excursions” — are included in the price of your trip. (My previous cruises charged us a pretty steep rate for every single excursion!) 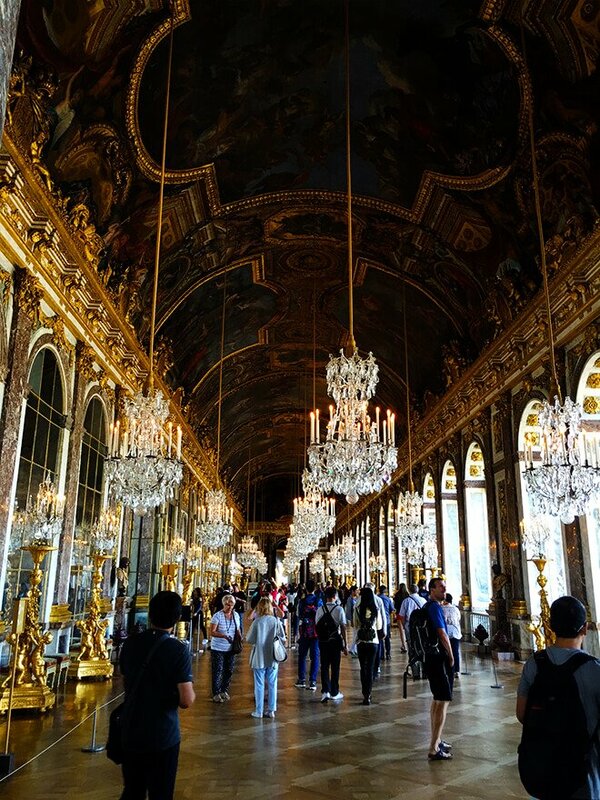 Granted, there are a few additional excursions that you can pay for with Viking — for example, we chose to go on a paid extra tour to Versailles, and some friends of ours paid to go on a tour of the Louvre — but we absolutely loved that daily tours were included. 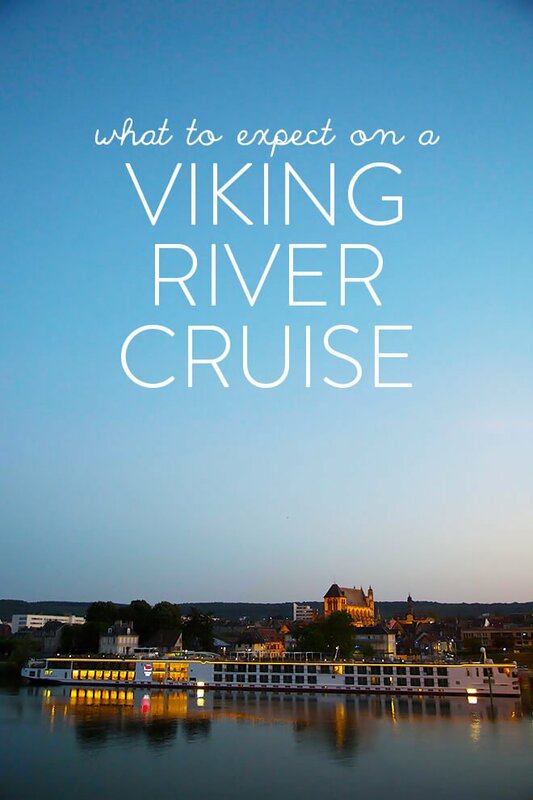 As I mentioned above, guests are encouraged to sign up for their specific shore excursions on the My Viking Journey website weeks before the cruise. So Barclay and I read all of the excursion descriptions and picked out our faves about a month before we left. But — I’ll be honest — a part of me wondered whether we would really enjoy the tours. I don’t know about you, but I’ve been on some less-than-exciting tours in my life, and Barclay and I tend to be free spirits when we travel anyway, usually wanting to strike out on our own to explore places. So we tentatively signed up to go on tours each day, but decided we would go on a few to see if we really liked them. Turns out, the Viking tours are freaking awesome. First off, every single tour guide we had was fantastic. They were extremely knowledgeable about the areas they showed us, they knew how to give a tour at a good pace (there are different tour groups for different paces, btw — brilliant), they knew how to keep us in the shade on some of those toasty summer days, and they were incredibly friendly and helpful. Basically, they were just really good at their jobs! My other favorite part of the tours was actually being able to hear the tours clearly, thanks to these handy little QuietVox audio receivers that we used for every tour. (You can see a pic of us modeling those below.) ;) Every guest has a set in their stateroom, where you can charge them up each night. 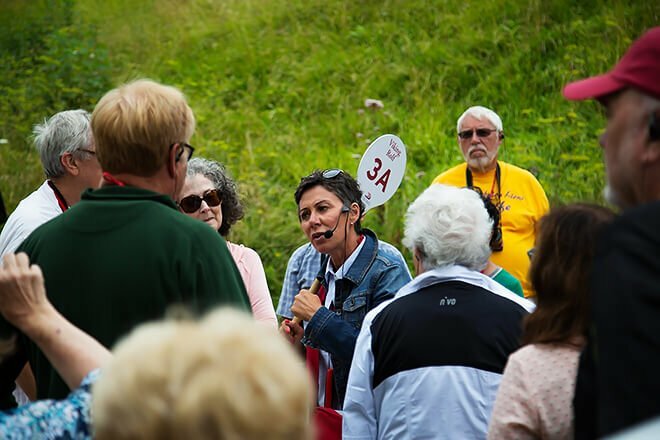 And then at the beginning of each tour, you sync your Quietvox with your tour guide’s, pop the earpiece in your ear and wear the receiver around your neck (or in a pocket) and — voila — you get to hear the guide’s voice clear as day. That way, your group doesn’t have to stay in a tight huddle for the entire tour and your guide doesn’t have to shout. Ah…technology. One of our many wonderful tour guides. Our snazzy QuietVox audio receivers. So yeah, I highly recommend going on the tours. But in addition to the tours, there are also all sorts of fun things you can do on and off the boat. Presentations: These were generally about an hour long, led by the program director, and they were awesome. He was a fantastic teacher, and gave engaging lectures on everything from Joan of Arc, to the history of the Vikings, to a primer on French cheeses (with an impressive cheese tasting buffet afterwards), as well as a daily “briefing” where we could learn more about the places we would be traveling the next day. Worth the time! Cooking Class: One day the chef and pastry chef demo-ed how to make a lemon tart. Pretty cool! French Class: Yep, pretty cute listening to a room full of people trying to learn some basic French phrases in 1 hour. Nautical Class: The captain offered a fascinating Q&A one night. Tea Time: There was the occasional French tea tasting during the afternoons when we were sailing. Cocktail Hour: Every night, there were drinks and music available in the lounge before dinner. And our favorite event at the end of every day? Beyond the ship’s official programming, we also loved going for long walks around town during the afternoons and evenings when the ship was docked. 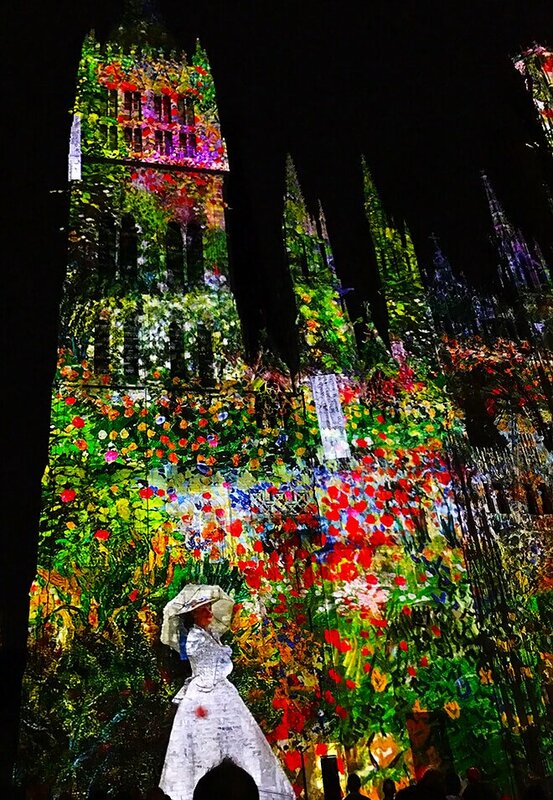 (<– If you happen to go to Rouen, be sure to get out and see the light show at the cathedral if it’s available, which is pictured below. Amazing!) We also loved taking little walks around the ship to say hi to people, and maybe playing a quick game of putt-putt up on the deck. 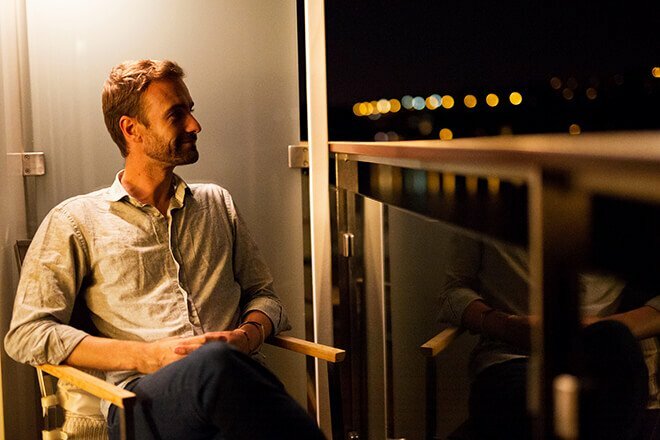 But again, probably my favorite “other thing to do” outside of the official ship programming was to grab a glass of French wine and sit up on the deck or on our little balcony and just watch the view as we sailed. Magical. 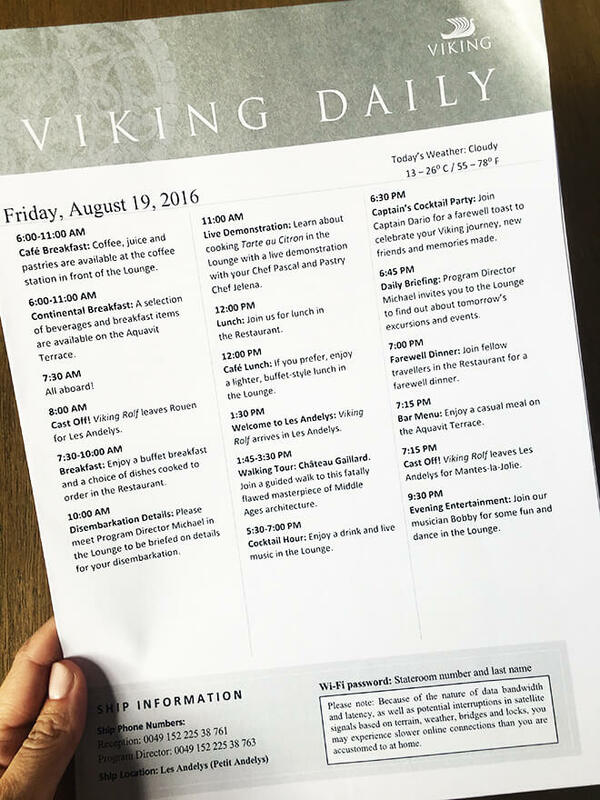 An example of the Viking Daily, which arrived in our room every evening. 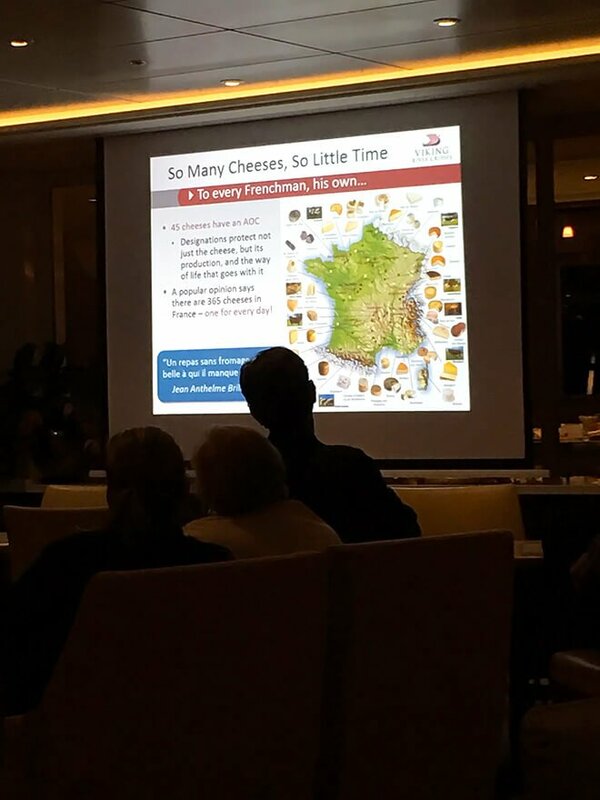 A fascinating presentation on French Cheeses 101. 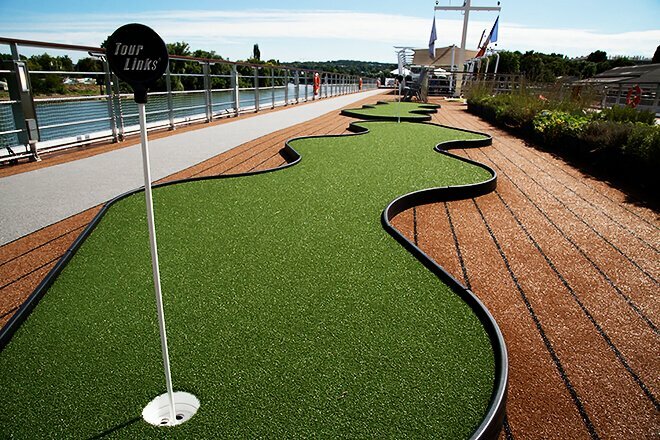 Anyone up for a little putt-putt? Ancient meets modern in this AWESOME light show at the Rouen Cathedral. A must-see, if you’re in town. Alright, so onto one of the most important topics, obviously — THE FOOD! I feel like I could write an entire post on this topic, because you guys, there was so much food happening on this cruise! And so much good food, at that. We did our very best to make the most of it. Breakfasts were served in a casual buffet-style, up on the Aquavit Terrace. (Or you could order off a small breakfast menu in the dining room.) Every day, there was a mega selection of hot dishes, from omelettes to pancakes to French toast to scrambled eggs and more. There was also an extensive selection of meats and smoked salmon and cheeses, as well as all sorts of fresh fruit. There were various breads for toasting, steel-cut oatmeal for loading up with your favorite toppings, yogurts for parfait-ing, and all of the French pastries your heart could ever desire. Oh, and fresh fruit juices and coffee, of course. Lunches were also served buffet-style on the terrace, or you could order in the dining room. Again, we (and most of the guests) opted for the sun-lit terrace most days. And this meal was always one of our favorites, because Barclay and I happen to be obsessed with soup and salad. I loved each of the daily soups, which were usually heavenly purees of some sort with all sorts of creative fun toppings. And Barclay loved the daily salad bar, piling the fresh greens as high on his plate as they would go. Viking also offered all sorts of delicious hot options for lunch, with different themes each day. But those soups, man. I want to go back and just eat All Of The Soups. Drinks are also notable on Viking because house wines, beers, soft drinks, coffee and iced tea are actually included in the cost of your cruise. And complimentary local cider was also served one day, as well as champagne at a happy hour, and probably something else that I missed. A great value! That said, Viking also offers an upgrade called the Silver Spirits Package, which Barclay surprised me with when we got on board. 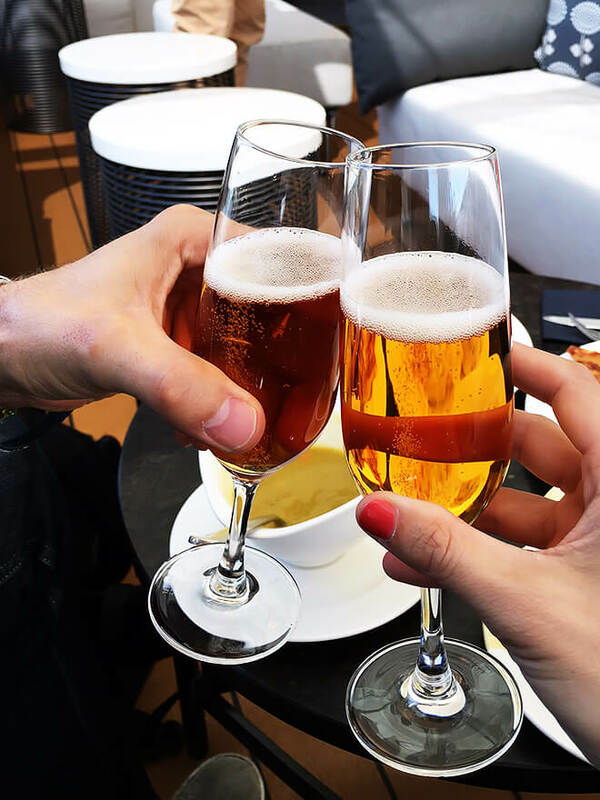 It includes “unlimited premium wines, beers, espresso drinks, juices and mineral water for the entire duration of your cruise, plus cocktails and a bottle of sparkling wine.” And oh my goodness, we had the best time with it! First off, we loved that this package included high-quality espresso in the mornings, which we looked forward to every day. Then we had a great time taking the sommelier’s recommendations for different wines every evening, some of which we have been obsessed with tracking down once we arrived home. 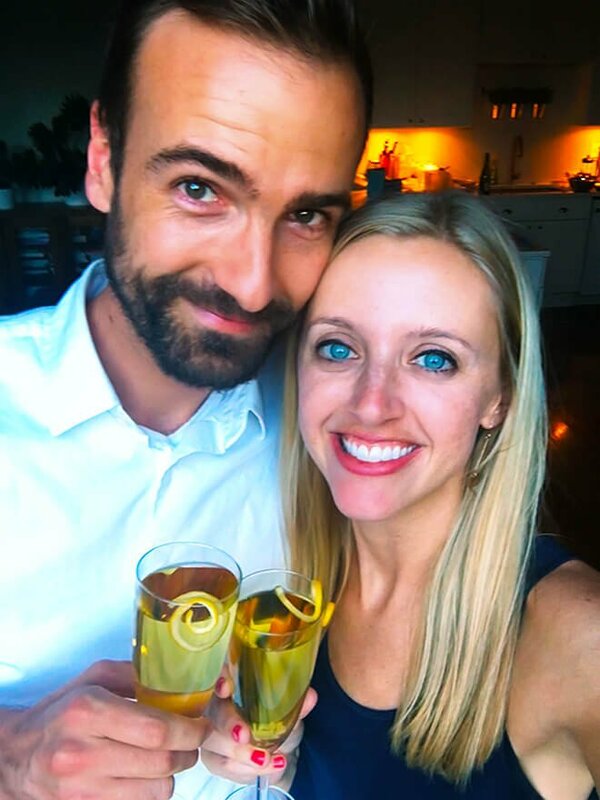 Then we loved sampling a few different cocktails throughout the trip. But I’ve gotta tell you — the absolute highlight of the Silver Spirits Package was their extennnnnsive scotch selection. Barc and I been getting more and more interested in scotch lately, and they had dozens of the labels we have had on our list to try. So each night, we basically arranged our own little scotch tasting with the bartender and absolutely loved it. So fun!!! And because of that, it ended up being a really great value. But that said, if you’re just looking for a glass of wine with dinner, I would probably stick with the included drinks. 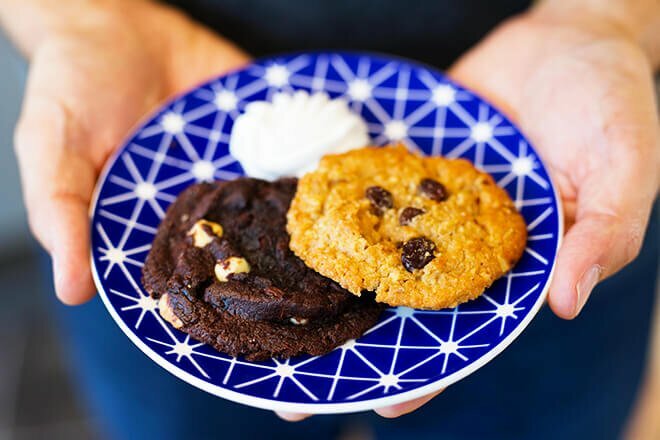 Freshly-Baked Cookies and a hot tea bar are also available on board at all times, although we were usually too full between meals to even want to snack! 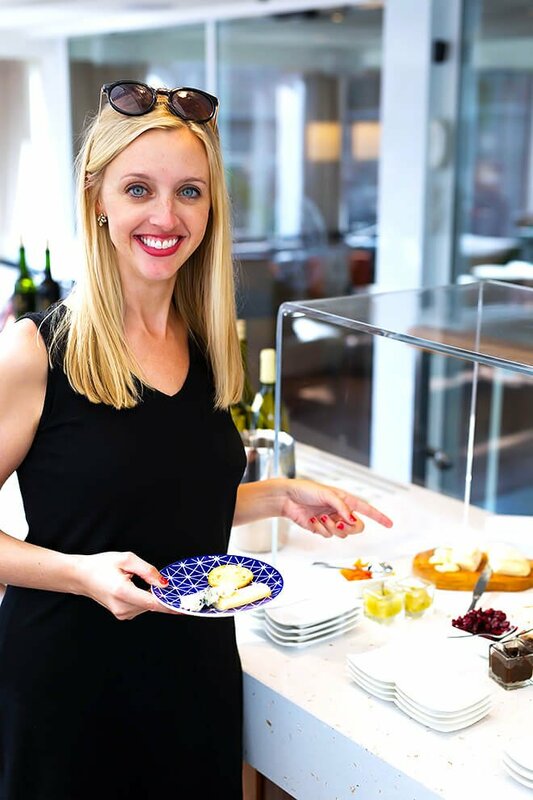 And All Sorts Of Other Snacks were also usually available in the Terrace between meals, including a selection of cheeses and jams in the afternoon (see first pic below), or whatever the chef decided to whip up that day. So yeah, the food was a-m-a-z-i-n-g. And I’d also like to say that — while there was a ton of it — the portions were much more “European-sized”, so there wasn’t a bunch of waste, which I appreciated. I think the food also varies depending on the region in which you are cruising, which is fun. 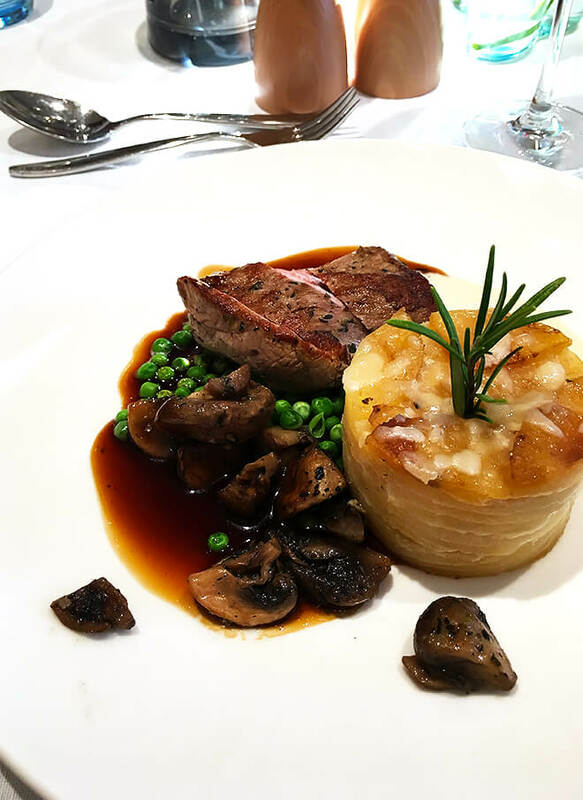 Our cruise was definitely the full-on French cuisine experience, which was a treat! Random afternoon snack buffet with French cheese, crackers, breads and jams. 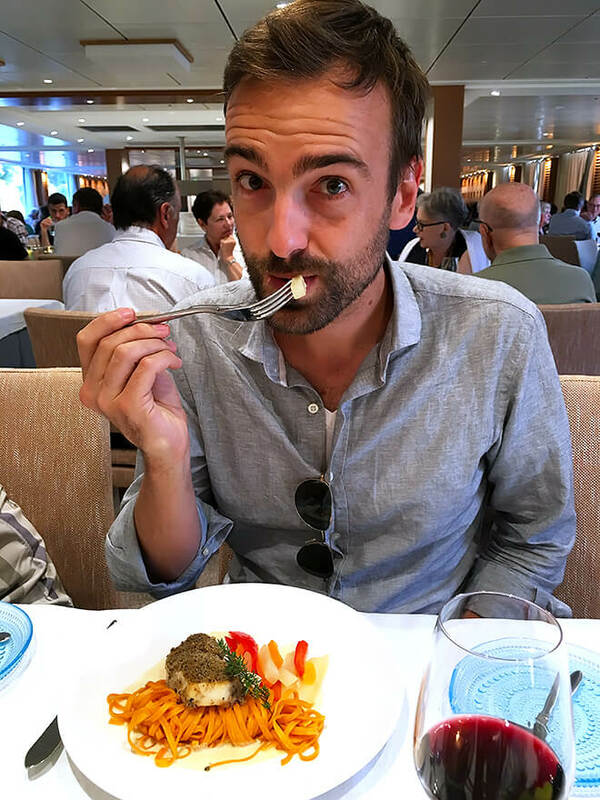 My handsome pescetarian, sampling all of the ship’s fish and plant-based entrees. Freshly-baked cookies were available on board all day. Local hard apple cider tasting on board! 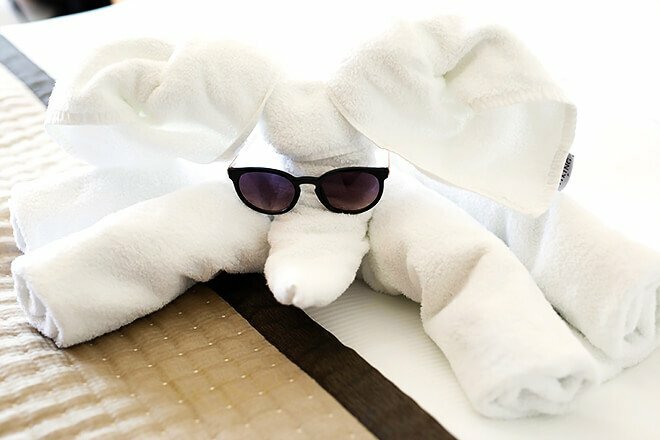 Without a doubt, the stars of our cruise were the incredible cast of staff members on board. Oh my word, I mean it. These folks take hospitality seriously, and went so far above and beyond to make our trip feel comfortable and memorable. And they were so helpful with everything!! Our dining staff also absolutely rocked it at meal times. From the baristas making our espresso each morning, to our sommelier helping give the perfect wine recommendations each evening, to our servers attending ultra-carefully to everyone’s dietary needs and favorite foods at each dinner, to the bartender helping choose the perfect scotches for our little “tastings” at night, to the awesome chef and kitchen staff working ’round the clock to make each moment of the day extra delicious — every single person we met looked after the guests so well. And of course, the star of each mealtime was our charming maitre d’, Manuel (see below). Oh my goodness, watching this guy work the room each night was freaking amazing. Literally within a day or two, he seemed to be good friends with nearly everyone on board, and made each guest feel so special and welcomed. We loved getting to chat with him each day and hear more about his life and adventures, and will forever be thankful to him for recommending one of our new favorite wines to us. We love you, Manuel! We also really enjoyed getting to know the programming staff on board. There was our brilliant tour director, Michael, who accompanied us out on the town each day and — Barc and I agreed — was literally brilliant. 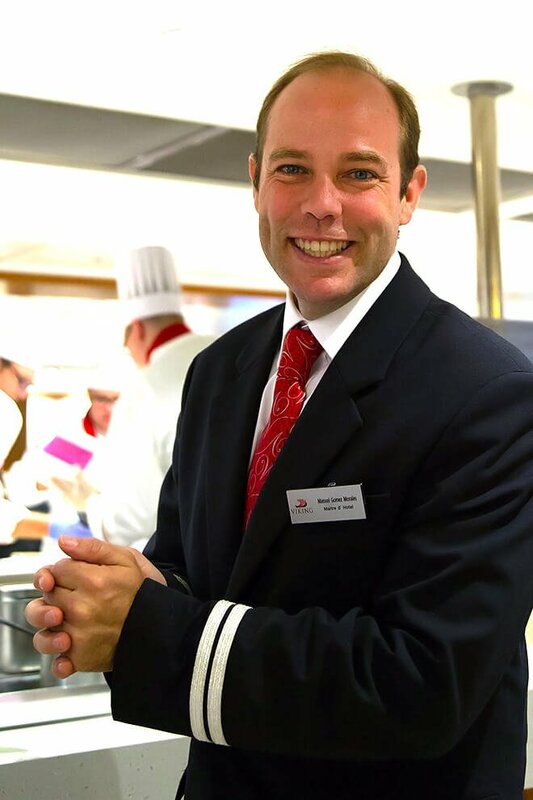 In addition to skillfully coordinating hundreds of guests with various individual needs each day on the tours, he also gave engaging presentations on board in flawless English, which was his fourth language (<– like, whoa). We also loved our concierge, Karina, who seemed so truly delighted by helping people plan memorable experiences. And it was a genuine privilege to spend some quality time with our hotel manager, Peter. Oh my goodness, this man was such an inspiration, and we loved getting to spend time having some deep and thoughtful conversations together. Barc and I learned so much from him, and were so thankful for his example of living such a thoughtful, adventurous, meaningful life. Manuel, our charming maitre d’. 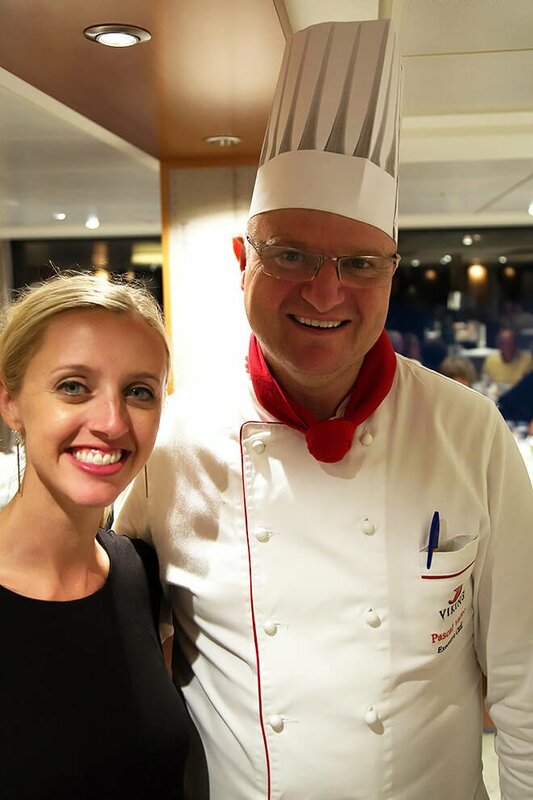 Getting to meet Chef Pascal — an honor! Before the trip, we had tons of people comment that we were surely going to be “the youngest ones on the ship”. And for anyone wondering about ship demographics — yes, we were in fact one of the youngest couples on our particular cruise, but not the youngest people. There were a few families on board with kids, and maybe a handful of couples in their 30s and 40s, but most were our parents’ age or older. But we absolutely loved it. Peter and Anne, a couple from Chicago whom I loved watching because they took such sweet care of one another. They had chosen our particular cruise because — as an art teacher — Monet’s home in Giverny had been on Anne’s bucket list. So it was awesome to experience some of that day alongside them. Tim, our late-night scotch buddy who first recommended the Silver Spirits package to us. This guy was a riot, and a pure extrovert, and must have known everyone on the boat. A true life celebrator. Jerry and Her 3 Daughters (Kim, Kristen and Karen), were a family who caught our attention the very first day on the ship. Jerry — who was about to turn 90 — had a spirit as youthful as any of us on the boat, and delighted in bringing her three daughters along on this trip together. 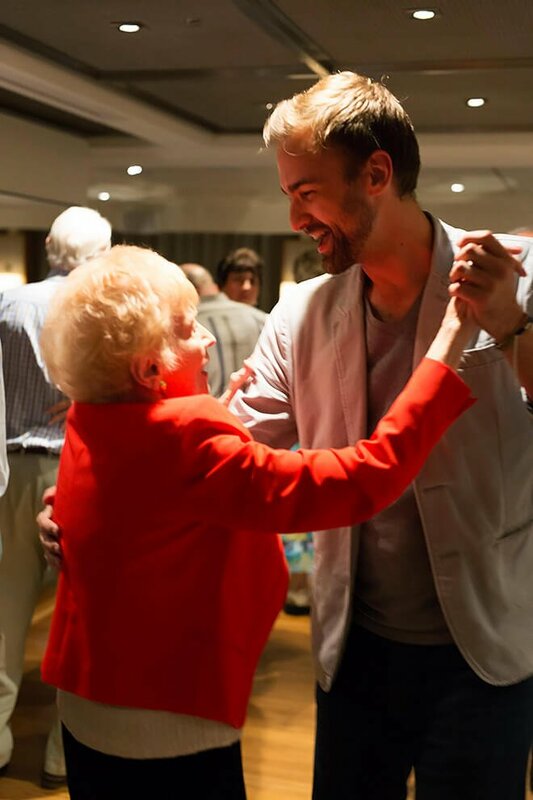 She also absolutely loved ballroom dancing, and taught Barclay a thing or two on the dance floor. (See below.) We so enjoyed spending time around this family, and the love they shared. Barc (ballroom) dancing up a storm with our friend, Jerry. 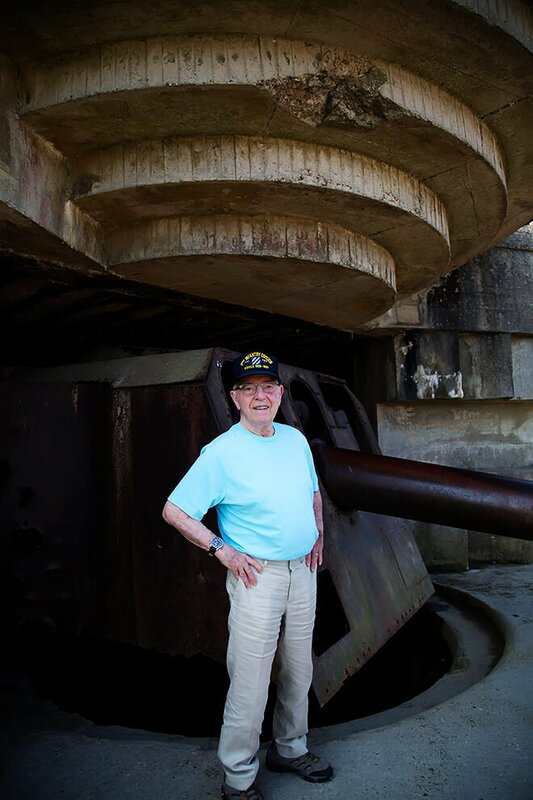 Spending time with our friend, Danny, on the beaches of Normandy. 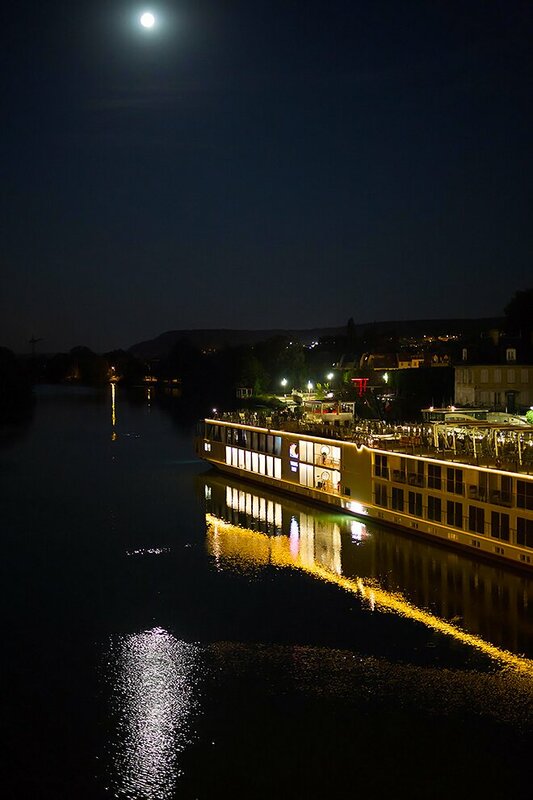 So…would we recommend going on a Viking River Cruise? 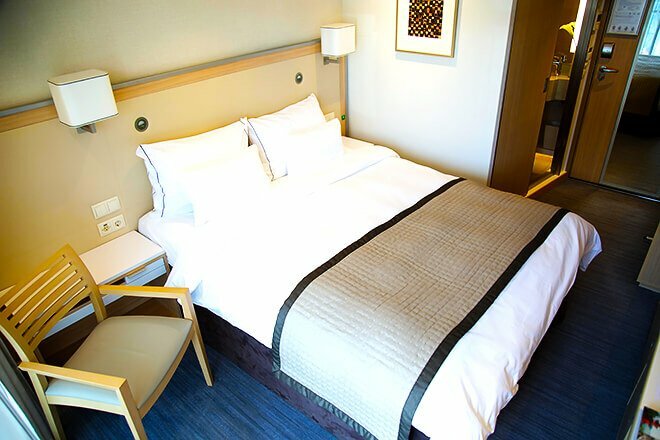 Without a doubt, Viking River Cruises are a significant financial investment, so it’s worth taking the time to figure out if this type of travel is really the best fit for you. But for all of the zillion reasons listed above (seriously — gold star to you if you’ve made it this far into the post! ), we absolutely loved our cruise. I’d also like to point out that one of the main reasons we ended up loving Viking (and have recommended it to many friends since) was because these cruises are such an easy way to get around Europe. Barclay and I have both had the privilege of traveling around Europe a handful of times before. And by contrast to past trips when we’ve had to spend significant time trying to figure out how to get from place to place — locating and checking in/out of hotels, hauling luggage, navigating the train system, renting cars, etc. — the Viking experience was so dang easy. We just arrived on the ship, unpacked all of our stuff in drawers right at the start, and then didn’t have to open a suitcase or worry about any of the logistics as we traveled all over France for the next 8 days. I can’t stress this enough — SO CONVENIENT. So if this all sounds like “you” and you’ve been wavering back and forth on the idea of booking a Viking River Cruise — or even if it’s not possible for you right now but you’ve considered putting it on your bucket list for “someday” — I would wholeheartedly say do it. The older I get, the more I believe in investing in experiences (vs. more “stuff”). And if you’re looking for an experience that will be totally awesome and delicious and memorable, I think you’ll be in very good hands with Viking. So big thanks to all of you for all of your awesome encouragement and tips you gave us before the trip, and thanks for tuning in for this update afterwards. Stay tuned for some new French recipes coming soon that were inspired by the trip. I have some good ones for you! 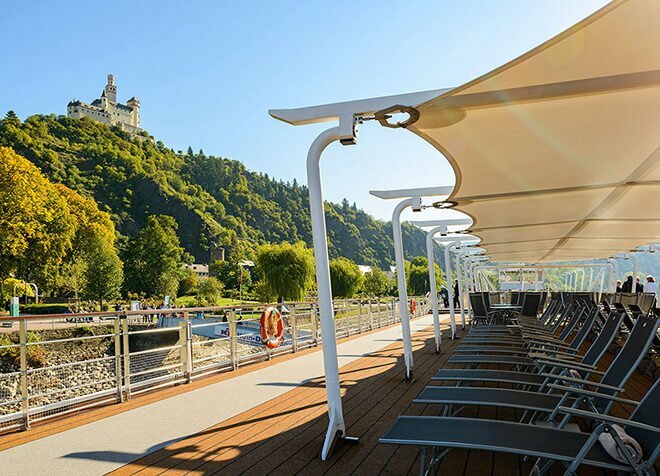 And if you’re interested in booking a Viking River Cruise, be sure to check out their awesome current promotions listed here. Wonderful & informative information! We are going on our first river cruise (on the Rhine) in August and counting the days until then. We have been on ocean cruises in the past, but looking forward to this because of the smaller scale/less travelers. All the information you provided confirmed our decision! 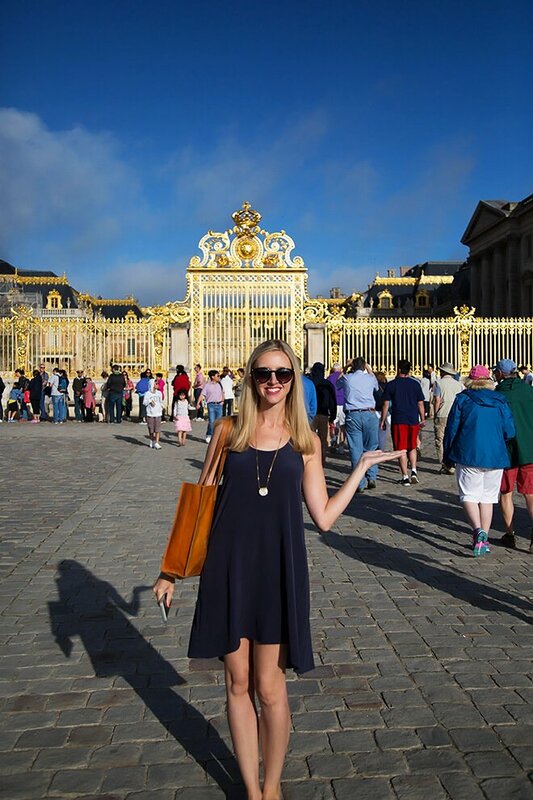 I went to Europe for a month last year (England to several destinations in Italy to Provence France to Barcelona Spain to a few days in Paris}. Fortunately I went with son, daughter in law, her mother and then later another friend joined us. My daughter in law did the majority of the planning (majority of housing was Airbnb) as well as mode of transportation; so I truly, very much enjoyed this vacation. However I could never have planned that trip or the work involved, plus packing/unpacking was not fun. Looking forward to being pampered by Viking Cruises. 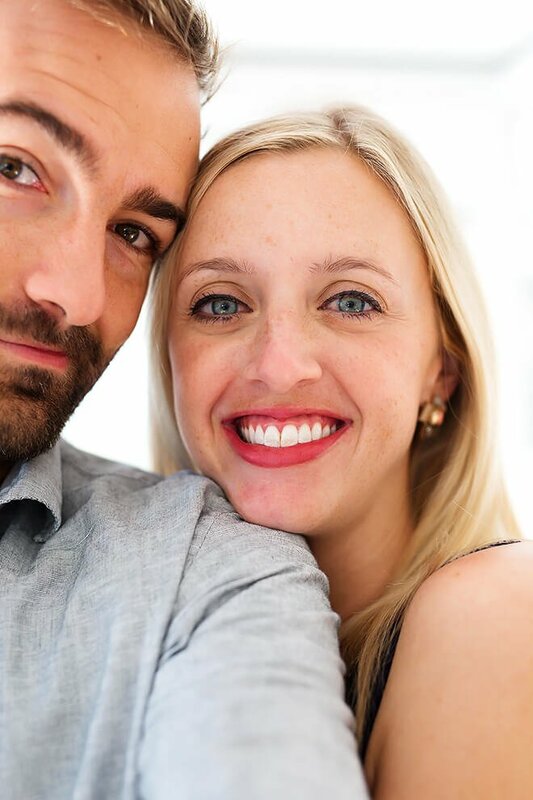 Again, thank you so much for your blog post! Thanks so much for the informative post! My husband and I have a river cruise on our “bucket list” but always found travel info for them a bit intimidating since so much is involved with one. Your post has helped me considerably in understanding what is going on and how things work on a longship:). We also found your info on Viking cruises to be very beneficial as we have family members trying to sway us to another tour group b/c “its just as good as Viking” but having read your review I now have proof that its not. We too, like to “invest in our memories” so we will definitely be looking at Viking when its time to book our cruise!